Career is where Arians shine the brightest! They are creative, ambitious and are driven by the need to succeed in whatever they do. They are born leaders and love being in charge. They are blessed with good foresight as well. They are not daunted by challenges and arrive at solutions easily. Unperturbed by competition, the bigger the challenge, they thrive more! Therefore, they opt for stronger, challenging roles in their careers. Aries is a powerful sign whose potential get smoothened and enhanced in lively and challenging atmosphere. As a fire sign they pour energy in whatever they do. A boring, regular job can mar their potentials and prospects. Self employment suits the independent nature of the sign. 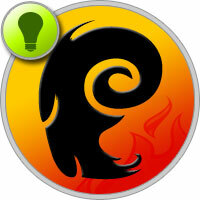 Aries born calculate risks with lightning speed and make decisions accordingly. Aries don't waste time and energy beating around the bush; they come straight to the point. Aries people launch themselves into projects with great enthusiasm. They are specially gifted in commercial affairs, such as launching new products and services. If employed they prefer to be in leadership role. They know how to inspire other people in generating the result that they want. The suitable professional industries for them include medicine, surgery, machines, metal works, agriculture, liquor houses, chemicals, railways, arms and ammunition, fireworks, tractors, buses. They can excel as dentists, explorers, army men, test pilots, fire fighters, trade union leaders, engineers, architects, surveyor, insurance assessor, psychologist, tailors, dyers, armoires, guards, wrestlers, dealers of sports goods to name a few. Aries are good at spending money. Seldom one can find an Arian who is a miser. Most among them think of today and never of tomorrow. They often advice other in spending and savings but they never follow the same. Aries are known to spend freely as per their desires and moods. As a result most of Aries Sun sign born do not have amassing wealth in spite of their strong desires. Natives born with Aries sun sign often like to spend money on sports, gambling and stock or commodity market. Hence often they lose money through impulsive actions and rash investments. They like to make quick money. Often they start in a flash and end in a crash. Their budget always remains as unbalanced. Most of Arian whether employed or entrepreneur has more than one source of income. The challenge for Aries to develop a habit of saving. In financial matters they should take advice of their partners. Natives with Sun sign Aries are blessed with quick witted mind that sharpens with new challenges. They like independence and go by there own decisions. With proper encouragement, right directions, backing and support these can reach their designated goals. At later stage they opt to change their course or line of study frequently. Here the task is to make them understand that it will only slow down there progress. Success with persistent hard work is ensured for them.